Dentures are a prosthetic replacement for missing teeth that can be removed and put back into your mouth as you please. Depending on each individual patient case, they may receive full or partial dentures. Full dentures are used when all of the natural teeth are removed from the mouth. We will take impressions and fabricate full dentures to replace your missing teeth. We work together with our lab to achieve a beautiful esthetic finish to give the patient back the beautiful smile they used to have. Partial dentures are another option when not all of your teeth need to be removed. They are similar to a bridge, but it is not a permanent fixture in your mouth. It can be removed at the patient's convenience. 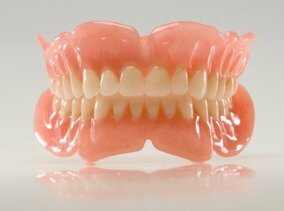 We offer a flexible partial denture, which is very retentive and comfortable for our patients. If you are missing teeth and would like to replace them, ask about how we can help you restore your smile with a denture or partial!